SymbolArt portraits provide a creative way for people to show their special qualities. Everyone has some combination of personal qualities that make him or her unique. Using mostly Celtic and Native American animal and plant symbols, I design original colored pencil portraits - symbolically. The first step is to decide which qualities you want represented in the portrait. I will find the animal symbol that best represents those qualities. Then I'll translate these personal qualities into symbols and design a unique colored pencil portrait. Coming up with the personal qualities to include in the painting can be challenging. I'll help you. Be sure to provide a phone number and email address when you order your commission so I can talk with you as I create your portrait. If you already know your totem (power, spirit) animals, I can include them in the painting along with other meaningful natural symbols. The meanings of each symbol can be written within the portrait or left out - whatever you prefer. Each portrait is accompanied by studio documentation and descriptions of the symbols included. SymbolArt portraits can also be designed for families, couples, and organizations. 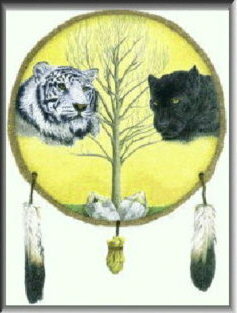 Medicine Shield expresses unique combinations of personal qualities the owner posesses, qualities the person hopes to achieve, challenges the person faces, or a combination of all three. A SymbolArt medicine shield can show the unique gifts one brings to family and community. The Celts, like the Native Americans, recognized the cyclical nature of life. One way the Celtic Druids represent this cyclical nature is with a wheel that marks the significant times of seasonal change - solstices, equinoxes, and the midpoints, or cross-quarters, between. This seasonal wheel is another SymbolArt background to hold the symbols that represent the inner person. Example. The Whole Brain Model® was developed by Ned Herrmann along with the Hermann Brain Dominance Instrument (HBDI.) The HBDI is a validated instrument that measures a person's thinking styles which are visually displayed on the model. The results of this profile can be translated into a SymbolArt portrait using Herrmann's Whole Brain Model® as the background. The colors of the quadrants are blue, green, red, and yellow. If you are interested in having this profile done for yourself please contact me for details. If you already have your profile, just send a copy of it and I will help you discover the animal symbols that best represent you. The Native American Medicine Wheel depicts sacred space, and it can also depict your sacred self. It is traditionally used for ceremonial purposes. As a SymbolArt portrait, it can be a personal wheel of life symbolic of your Earthwalk. Totem animals included using this background can represent your physical (West), mental (North), spiritual (East), and emotional (South) aspects. (See Spirits of the Earth by Bobby Lake-Thom. Or it can include those for East, South, West, North, Above, Below, Within, Right Side and Left Side. See Medicine Cards by Jamie Sams and David Carson.